Still sewing on all those stockings in my spare time. Eventually I'll get finished, and when I do, I'll show them to you. I've posted several of the shop items in the etsy store for now, but will move them when the blog store opens. When exactly will that open? Ummm, wellll, ummmm, as soon as I finish learning to use the shopping cart feature properly, which I hope will be sooner rather than later. Remember me telling you about that favorite fabric I love so much? Here it is in a set of feather pillows, embellished with a deep red chenille, a textured dotted copper fabric, and a woven, high sheen polka dot, and finished off with a whimsical, pouncey, multicolored fringe and beautiful trims. Click on picture to enlarge and see details. The top right hand picture is the true color of the fabrics. And yes, I will change the pictures before I post them in the store. 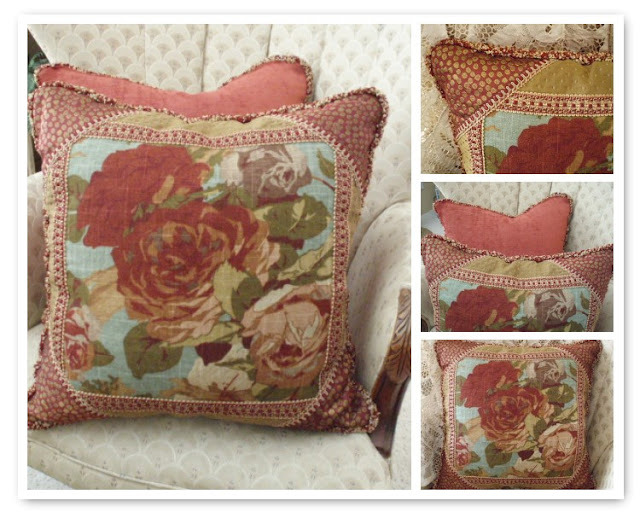 These are a great set of comfy feather/down sofa pillows. It's a one of a kind set, as will be most of the things in my new store. I'm trying out the mosiac maker in an effort to make my posts a bit shorter since I tend to 'over-post' pictures. Find that little goodie right here. That pillow is gorgeous! You do beautiful work. Thanks for the link to the mosaic maker...I linked over there and it looks like they have a lot of fun things to do with pictures on their site. Thanks! Great pillows Polly. I'm a pillow maker too, and I love your attention to detail. Thanks for the link too. Will look forward to seeing more. I just found your blog from your comment over at Gina's. Thanks for sharing! Love what you do here so I just became a follower! Your pillows are gorgeous, Polly!